Atlanta – September 12 2012 – Qoppa Software, a leading provider of PDF solutions, releases newly improved versions of all of their Java PDF library products. Qoppa’s Java PDF class libraries are enhanced with a new powerful algorithm for text extraction. “The order and organization of text objects in a PDF document do not necessarily correspond to the logical reading order. We have developed a new text extraction algorithm which detects the natural flow of even structured PDF documents such as research or newspaper articles. We’re very happy with the results when compared with other PDF tools.” says Gerald Holmann, Qoppa President. The new release also adds enhanced memory management so the PDF libraries can handle rendering and printing of very large CCITT fax images (200Mb and above). Also new in this release is Qoppa’s pan and zoom tool which will allow users to zoom in and out of high-resolution pages and move around a page (“pan”) while also displaying a larger view of a page. This new tool should greatly benefit professionals working in the media, print, and graphics industries. Thanks to the revision of Qoppa’s text extraction algorithm, text selection and highlight is also greatly improved in the visual components. Now cursor based, it follows the logical reading order of structured documents and allows marking up text across columns. This entry was posted in Java PDF Library, Qoppa Software Events and tagged Java Libraries, Java PDF Components, Java PDF Libraries, performance, Qoppa Software, rendering, text extraction on September 19, 2012 by qoppacom. 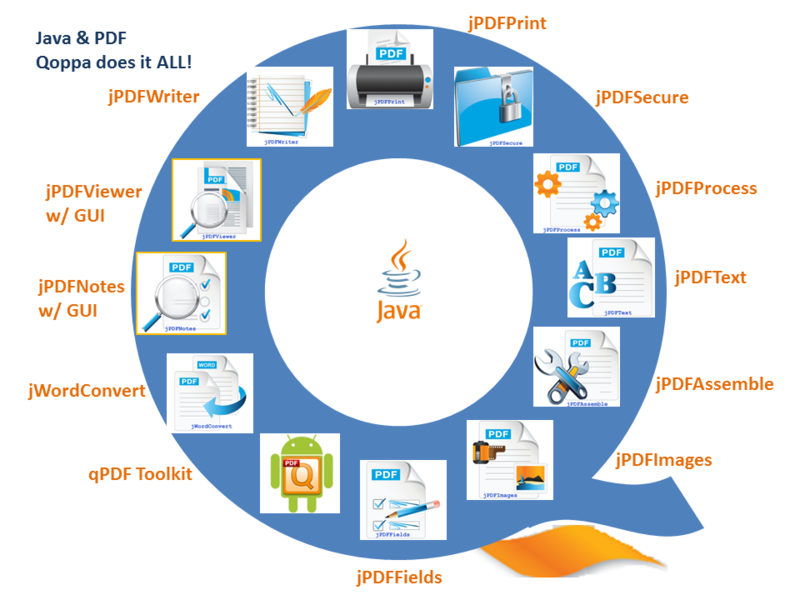 Qoppa Software has published this new video introduction to our Java PDF Library products and components – a library for every PDF processing need. Why choose Qoppa’s PDF library products? This entry was posted in Java PDF Library, Qoppa Software Events and tagged Java Libraries, Java PDF Components, Java PDF Libraries, PDF, Qoppa Software, Video on September 17, 2012 by qoppacom. Atlanta, GA March 19 2012 – Qoppa Software’s new spring release of Java PDF components and libraries delivers API improvements for easier integration into Java and web applications, along with UI improvements to make the PDF components easier for users to work with. Key among the features delivered this spring is the ability for Qoppa’s library jPDFProcess to create linearized PDF documents. Linearization allows fast viewing of even large PDF documents over the web because pages of linearized documents are made accessible without the need for downloading the entire file. With the new release, programmers gain further control when integrating the PDF libraries into applications. The revised API now supports adding PDF content to a specific layer, creating rotated rubber stamps, and adds a convenience method to overlay a watermark on top of PDF documents when viewing and printing. Moreover, Qoppa’s team has made licensing easier by simplifying the process of requesting, validating and setting license keys. This release also adds many improvements to Qoppa’s visual PDF components such as a new invert colors mode and enhancements around interactive PDF forms, including support for Submit and Reset buttons and even better editing of interactive form fields data. Qoppa Software specializes in the development of high-end libraries and applications to work with PDF documents. Qoppa Software offers a suite of cross platform products that cover every aspect of PDF processes and integrate seamlessly into document work flows, including end-user, server and PDF library products. Qoppa’s products are carefully designed and developed on Qoppa’s own robust PDF technology to provide the highest level of performance and reliability. This entry was posted in Java PDF Library and tagged announcement, Java, Java Libraries, Java PDF, Java PDF Components, Java PDF Libraries, libraries, linearize, PDF, Qoppa Software, Stamp PDF Documents on March 19, 2012 by qoppacom. Atlanta, GA 25 October 2010 – Qoppa Software, a leading provider of PDF solutions, is pleased to announce the release of new versions of its Java PDF Libraries and Components, adding PDF feature coverage along with improvements in memory management and performance. New unicode support in jPDFProcess, jPDFAssemble, and jPDFNotes. These libraries now allow editing unicode text in annotations content and within document properties (author, subject, description). This will be of special interest to customers using non-latin characters such as Arabic, Asian (Chinese, Japanese and Korean), Greek, or Cyrillic characters. New callout annotation in jPDFProcess, jPDFViewer, jPDFNotes. The callout tool combines a text box with a line and an arrow and is used to draw attention to text or objects in a PDF document. New calibration tool in jPDFNotes The measuring tool now also allows architects and engineers to set the scale directly on the drawing. Enhanced digital signatures in jPDFProcess and jPDFSecure. Developers can customize digital signatures by adding custom appearances (for instance adding image and text). Qoppa Software™, founded in Atlanta in 2002, develops and delivers high-end libraries and applications to work with PDF documents. Qoppa Software specializes in PDF solutions, with a strong focus on delivering high quality solutions that are widely portable. Qoppa solutions include developer components, desktop and server applications, and command line utilities that will run on any operating system. This entry was posted in Java PDF Library and tagged Java PDF Components, Java PDF Libraries, PDF Components, PDF Libraries, Qoppa Software on November 4, 2010 by qoppacom.